RIM | The Small Wave. While the competition peaks at “about average”, Apple passes “better than most” to be “among the best”. Not sure the word “among” is even necessary. Marketing can be a chess game. Steve’s made his move, now his competitors get to make theirs. “Them’s fighting words” for these guys, and they’ve already had some nasty things to say about Apple drawing them into its “self-made debacle.” Careful with this one, boys. You may protesteth too much. More and more stories are beginning to appear confirming that this really is an industry-wide problem, and other phones do suffer from a similar death grip. Good article that sums it up well. 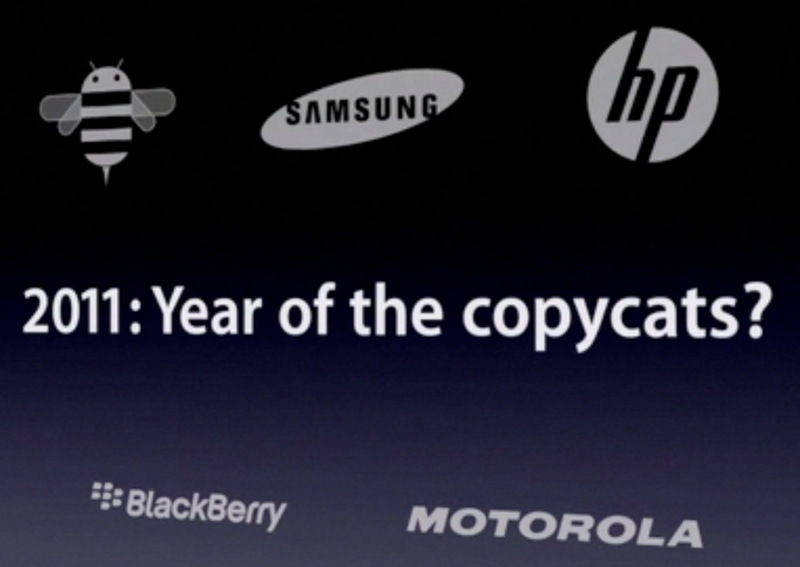 I chose the above quote because the statements from RIM, Nokia, HTC, etc. have all been non-denial denials. Like the author, I agree this should backfire on them, but believe it won’t because their phones just aren’t that interesting. Why would a tech site spend their time thoroughly testing other companies’ “death grips” and then publish the results when no one will click the link anyway? Apple gets page-hits, others do not. This stopped being about “news,” or “concern” for the consumer, and crossed over into the realm of SEO and page hits long ago. Above is the full statement from RIM Co-CEOs Mike Lazaridis and Jim Balsillie. Sounds harsh, yet nowhere in that torrent of words do they deny the Blackberry Bold has a death grip issue. Good thing, too, because it most certainly has one. I have an iPhone 4 and can reproduce the death grip; once I knew how to hold it, it was easy. But I also own a BlackBerry Bold 9700. Guess what? Now that I know how to hold it, I can reproduce the issue with it, too. In fact, my tweet about it came many hours before the Co-CEOs published their non-denial denial. But what about the Bold owners who swear they can’t reproduce it? I guess we pay as much attention to them as the iPhone 4 owners who say they can’t reproduce it, either. Fair’s fair, right? I’d like to point out that I’ve never dropped a call on my iPhone 4 or Bold, both sans cases, so the real world counts for something. It’s a shame that even with two CEOs RIM weren’t smart enough to let this go, choosing instead to get all puffed up while not even denying what they presumably got puffed up about in the first place. Meanwhile, the reason RIM “has avoided designs like the one Apple used in the iPhone 4” is because Blackberrys are relics from a half-decade ago. The most “innovative” thing RIM’s tried to do in five years is add a touch-screen to a track-ball based OS, and they failed miserably. Both times. This is why they’ve been giving their phones away—buy one, get one free—for nearly a year. The good news for RIM is that people are so disinterested in their out-of-touch (pun intended) relic that the Bold won’t get near the attention Apple’s innovative iPhone has. This is one time where RIM’s inferior product will actually help them.